"Developing an educational environment and culture where the surgeons of tomorrow can be trained to the highest standards and are allowed to flourish to their full potential." If you're looking for superb Surgery training then the East Midlands is the perfect place to develop your career. Whether you're looking for Core Surgery, General Surgery or one of the Surgery sub-specialties, you'll learn at some of the UK's leading facilities under the supervision of national and internationally renowned experts. Keep reading to learn more about Surgery training in the East Midlands. When you come to the East Midlands for your Surgery training you're joining a region with an international reputation for excellence. And, thanks to the unique geography of the region, rotations are designed so you don't have to move home or face a long commute. 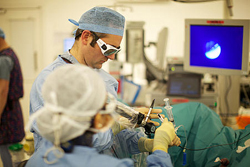 As well as Core and General Surgery training you can also benefit from structured, high quality training in a range of specialties including Plastic Surgery, Urology, Vascular Surgery, Paediatric Surgery, Neurosurgery, Ophthalmology, Cardiothoracic Surgery, Otolaryngology, and Trauma & Orthopaedic Surgery. Centred around the towns and cities of Leicester, Nottingham, Derby, Lincoln and Northampton, the East Midlands is one of the UK's most vibrant regions. House prices are 44% lower than the South East and 62% lower than London with hourly trains to London taking around 70 minutes.